Massive joint U.S.-South Korea military exercises are a spring ritual on the Korean Peninsula guaranteed to draw a lot of threat-laced venom from Pyongyang. SEOUL, South Korea (AP) — North Korea caused a new stir Wednesday by publicizing a purported mock-up of a key part of a nuclear warhead, with leader Kim Jong Un saying his country has developed miniaturized atomic bombs that can be placed on missiles. South Korea's Defense Ministry quickly disputed the North's claim that it possesses miniaturized warheads. It called the photos and miniaturization claim an "intolerable direct challenge" to the international community. 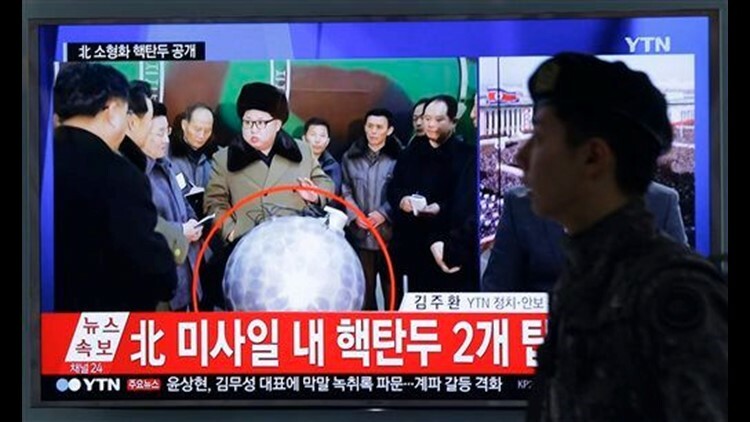 The round object shown in the photos appears to be a model of a warhead trigger device which would contain uranium or plutonium, according to nuclear expert Whang Joo-ho of Kyung Hee University in South Korea. He said it was obviously a model because Kim and others would not stand near an actual device because of concerns about radioactivity. Karl Dewey, a senior analyst for IHS Jane's, a defense and aerospace publishing company, said the sphere could be a simple implosion weapon, possibly with hydrogen isotopes added to make it more efficient. "It is unlikely that the object in the photo is a thermonuclear bomb (also referred to as a hydrogen bomb)," he said in a statement. "Thermonuclear weapons are multistage devices and in modern weapons the need to place two separate stages together would result in a more oblong-like structure." North Korea says it tested its first H-bomb on Jan. 6, followed last month by the launch of a rocket that put a satellite into orbit but which violated U.N. resolutions because it employs dual-use technology that could also be applied to long-range ballistic missiles. Associated Press writers Kim Tong-hyung in Seoul and Eric Talmadge in Tokyo contributed to this report.